Fast Amphibious PWC/ATV Set to Go on Sale in U.S.
DETROIT (AP) — Amphibious vehicles could soon be zooming out of James Bond’s garage — or pond — and into yours. The Quadski — a one-person all-terrain vehicle that doubles as a personal watercraft — is being billed by its makers as the first high-speed, commercially available amphibious vehicle. It’s scheduled to go on sale in the U.S. by the end of this year for around $40,000. Michigan-based Gibbs Sports Amphibians Inc. hopes to sell the vehicle worldwide by 2014. 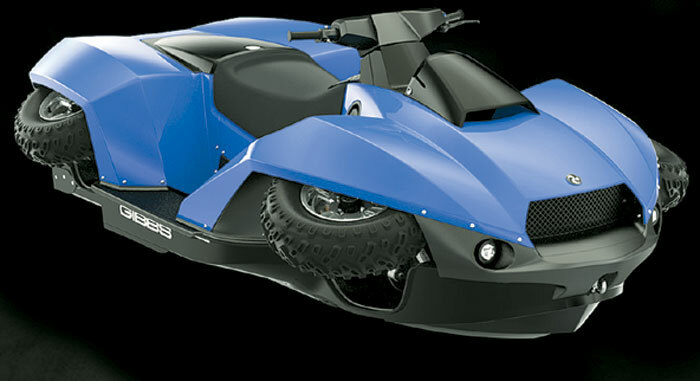 With its all-terrain tires and four-cylinder BMW-supplied engine, the Quadski can drive up to 45 mph on land. To take it into the water, the driver presses a button. In five seconds, the four wheels fold up and tuck into the sides. The Quadski can reportedly zoom off at a blistering 39 knots on the water before a press of the button brings the wheels out again. “You just drive straight into the water, quite fast, and keep on going. It’s sort of magic,” the founder of Gibbs Sports Amphibians, Alan Gibbs, told the Associated Press in a recent interview. History is littered with attempts to make fast, long-lasting amphibious cars, from the campy German Amphicar of the early 1960s to current companies that rework sports cars by hand for $200,000 or more. But Gibbs, a former diplomat and entrepreneur from New Zealand, said the Quadski is the first land vehicle for sale that can go faster than 8.6 knots on water. A lightweight, fiberglass hull and front wheels that rise mechanically when the vehicle hits the water are among the tricks the Quadski uses.